The Dark Custom 2018 Fat Bob is a tough looking bike and our idea was to make it tougher and darker, meet the Black Op’s Fat Bob! 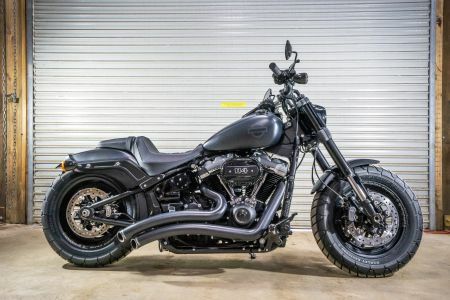 Ready to take on any mission with a stage 1 114CI Milwaukee-Eight motor, black pipes, adjustable air shock suspension and as much black as we could get, using black levers, and the Willie G dark skull black collection. We kept the build clean and simple using the natural appeal and styling of this new soft ail platform and added extra grunt to this popular model, resulting in a tough and versatile motorcycle with the power you want. H-D components: Black hand control lever kit, Willie G skull black timer cover & Willie G skull black derby cover. Additional components: Fender eliminator tail tidy, Freedom Performance M8 sharp curve radius black exhaust, Legend Air M8 air shock, Dyno Jet Power Vision tune.